SPINNING AND WEAVING. I guess it’s no secret that I’m a big fan of history, and Texas, and Texas history, and interesting people, and cool places, and learning stuff I didn’t know, and…well, you get the idea. And since I’m a writer, I also like sharing stories about those places and faces. I used to do that by writing for several small-town newspapers, these days I share via social media. Several month ago, I visited with JOHN and INGRID NABORS, of De Leon, Texas. 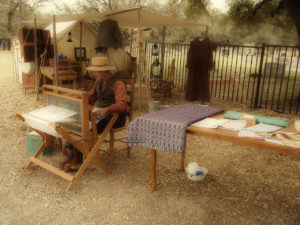 John and Ingrid have been participating in living history demonstrations for about 17 years, but they’ve been spinning and weaving for about twice that long. 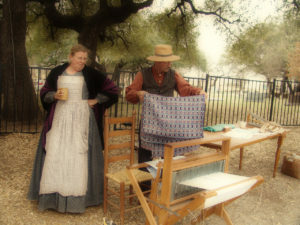 I caught up with them at an event in Acton (Hood County) Texas, where they were sharing their skills with those in attendance at a Texas Independence Day celebration near the burial site of Davy Crockett’s wife (see previous post) in the nearby Acton Cemetery. 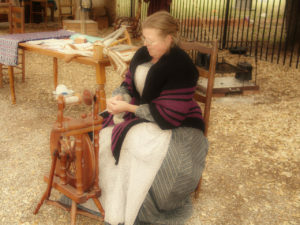 As the couple, dressed in period clothing, worked a castle-style spinning wheel and jack loom, people of all ages gathered to watch. Young people especially seemed fascinated by the process. The Nabors use wool from their own sheep (the kids watching the demo were amazed at how soft it is). After the wool is shorn, skirted (picked and cleaned) and carded, it goes on the spinning wheel. The first time through the wheel, there are two spools, going clockwise. The thread is then put together, and spun again, this time going counter-clockwise. Taking a project from wool to finished garment can take about six weeks. (The dress hanging near the tent was made by the Nabors). John is a Texas native, while Ingrid was born in Holland. “But I’ve lived in Texas 35 years now,” she said. 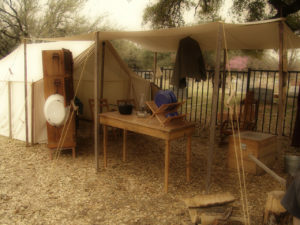 In addition to dressing in period clothing, the Nabors also stay in a tent, and often prepare their food over a campfire when attending the living history events. Their three children also traveled along with them in earlier years. Love that answer. Thank you for sharing your story, Ingrid and John.